NarrativeWave combines the engineers' knowledge with operational data to drive outcomes that immediately impact business operations. Companies can now take complete advantage of the Internet Of Things to increase their operational efficiency and drive new competitive advantages. 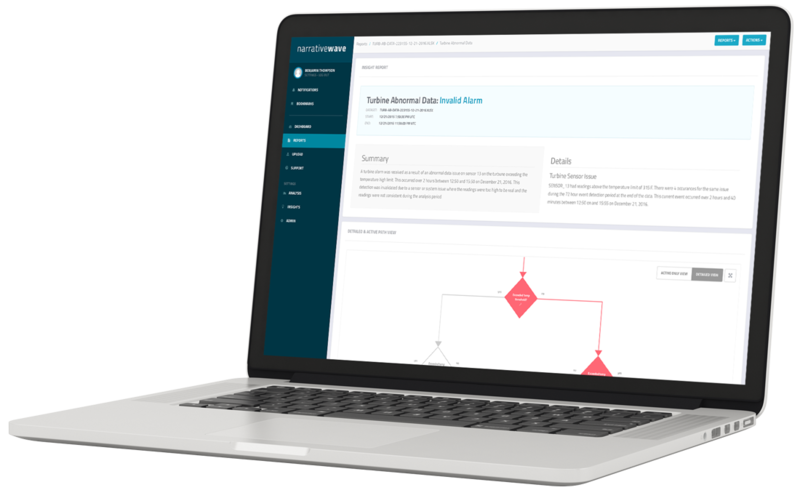 A unified and cohesive software easily customizable by engineers to automate the root cause analysis of events, delivering complete explanations and direct recommendations at unprecedented speed. NarrativeWave turns data into actionable insights, a powerful asset you can use to make better decisions. Automates manual labor intensive processes incurred by complex analysis of large sets of data. Computer automated processes deliver more reliable insights & eliminate human errors when diagnosing alerts and alarms. Enables engineers to build models on their own, without a developer or data scientist. 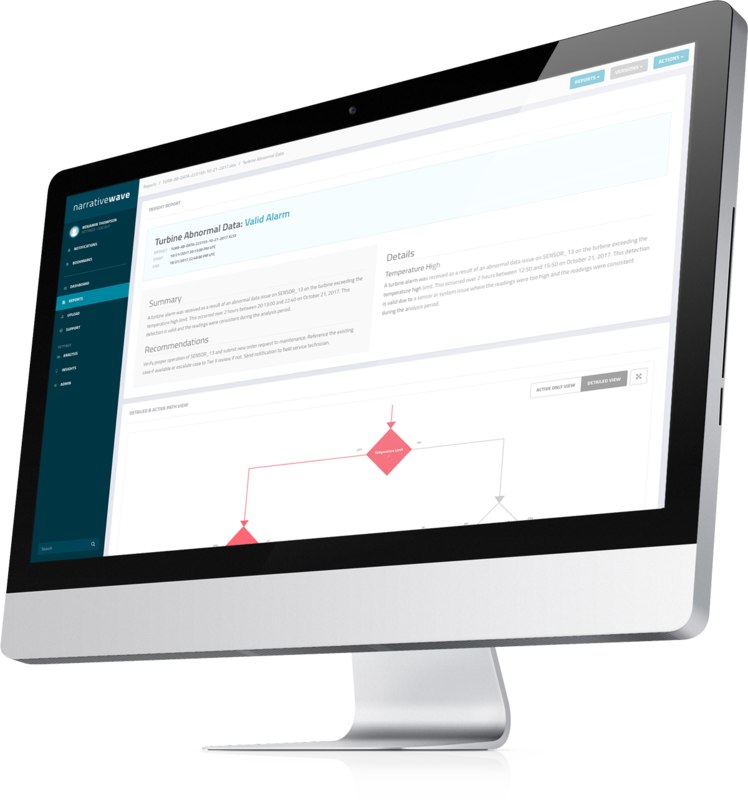 Creates a next generation knowledge base established on an accurate understanding of your data, analytical models, and assets. Automatically identifies the root cause of events like alarms and alerts using advanced analytic models generated from engineers in an intuitive interface. Translates analyses results into insights using Natural Language Generation (NLG) to provide explanations and specific recommendations in the engineers' vocabulary. Create advanced workflows using steps and analytics models in a user directed interface flexible and easy to understand. Generates dedicated visualizations for the context analyzed making it easier to dive in the amount of data processed. Prevents operational disruptions before they occur by enabling engineers to set up thresholds based on patterns that correlate with past problems or failures. Bring together the subject-matter experts (SMEs) experience, making it available across functions, departments & regions. Collecting and receiving data can be handled directly from our full REST api or using custom “hooks” to fit in almost every kind of environment. Scalable and secure, our cloud infrastructure is made to handle some of the most complex datasets and analytic models. Combining modern methodologies and technologies to build a high-quality solution powering an industry transformation.